They have been working on it since November, starting with regular rehearsals every day after school. This month it reached a crescendo when the rehearsals went every day but instead of ending at 5 pm ended at 6 pm. This past weekend both days were spent doing cue-to-cue, and a full dress rehearsal. 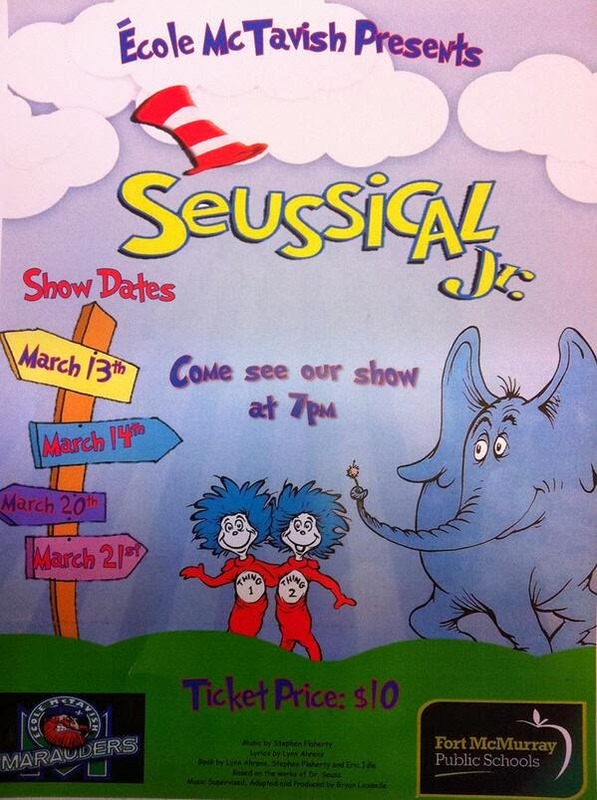 And this Thursday at 7 pm it hits the stage at École McTavish, when the school production of Seussical Jr. finally premieres. The Intrepid Junior Blogger auditioned for a role way back in the fall. She came home very excited to be in the cast, and I knew that once again, just like for Annie last year, our house would be plunged into full-on musical preparation. For months, and increasingly so in the last two weeks, the only music I heard emanating from the basement was endless ditties about Horton and Whos and other Seuss characters. But who can argue with Dr. Seuss and the fantastic world he created, one that even adults such as myself are drawn again and again? I admit it. When I went through the IJB's books a few years ago I donated many, but I couldn't let go of the tattered copy of One Fish Two Fish Red Fish Blue Fish. The copy of Horton Hears A Who is still on our bookshelf, along with the copy of Oh the Places You'll Go I bought for her soon after she was born. I remember endless nights when she was little reading those books to her again and again and again, both us caught in the magical world of Seuss. I could have never imagined that the tiny little girl who pointed to the pictures and who learned to read through Dr. Seuss would one day perform on stage with all things Seuss as the theme. Late one night this week I crept out of bed, unable to sleep. I pulled One Fish Two Fish Red Fish Blue Fish from the bookshelf, a book that has seen better days. It is torn and the cover is missing. I read it once more, letting it take me back over a decade to different days and when the IJB was so much smaller. This week I will sit in a school atrium and watch her on stage, my not-so-little girl as she performs in her last Junior High musical before she moves on to high school next year (and her new dreams of performing on the stage there and at Keyano Theatre). I suspect Seussical will take me back a few years, and, as usual, if you look closely there may be tears glistening in my eyes just as they are while I write this. I know that the performers have poured their heart and soul and time into this production. I know, too, that this is the final time I will see her perform on that stage, and that she is moving on in her life. And yet to me she will always somehow be that little girl holding a copy of One Fish Two Fish Red Fish Blue Fish in her hands and pointing to the words, no matter the places she will one day go.